If time is money, then your calendar is a potential goldmine. Syncing your Google Calendar in HoneyBook will help you stay on top of your day-to-day and make sure that a minor scheduling error doesn’t lead to a major missed opportunity. Turn both on for a two-way sync! Google Cal Meetings: visible in your HoneyBook calendar, but only in the synced person’s calendar (not on team members’ calendars). Tentative HoneyBook Projects: visible in Google Cal. Tentative Projects are any that have not yet been booked, such as new inquiries or a Project with no booked files (signed Contract or paid retainer). Booked HoneyBook Projects: any Project that has either a signed Contract or the first payment (retainer) paid. This would generally be inside a Proposal or Invoice. PLEASE NOTE: You cannot manually mark a Project as Booked within your calendar. If you wish to have a Project show up as Booked, you must have a signed Contract or a payment submitted by your client. If your client paid outside of HoneyBook, here's how to mark that payment as paid! Archived Projects: no information from archived Projects will be visible, including payment dates. TBD Projects: if a Project does not have a Project date associated with it, it will not be visible in your HoneyBook calendar. As owner of the HoneyBook account, you'll be able to see all Projects that you have created (making you the Project owner) or Projects that you have been invited to (making you a Project participant). If you’ve added team members to your HoneyBook account, they'll each have their own separate HoneyBook calendars. Like the account owner, the Projects that show up on a team member’s calendar are those they've created (Project owner) or been invited to (Project participant). 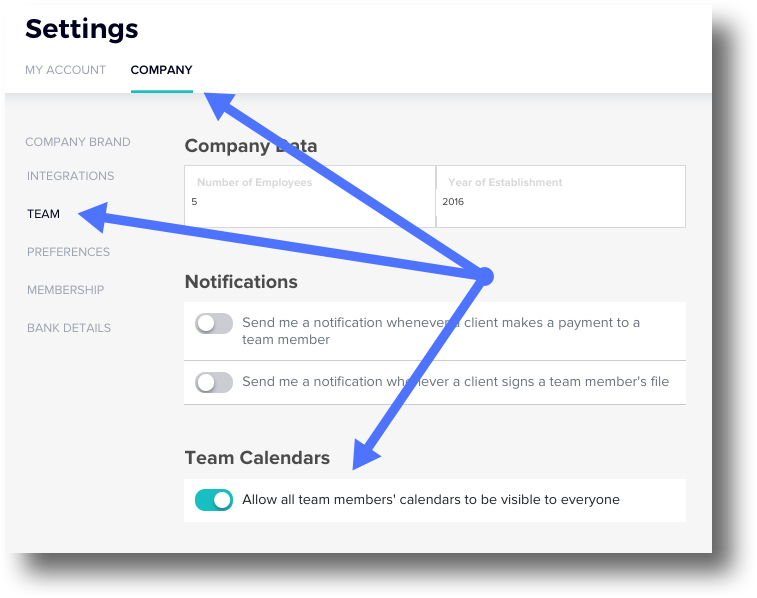 If you’d like all team members’ calendars to be visible to everyone, you can turn this on under Company Settings → Team. This will activate the team calendar view, which can be toggled on and off for each team member to view only their own Projects, or Projects across teams. PLEASE NOTE: Only the Account Owner can turn this setting on. If you’d like to allow a team member to view your calendar, this must be done through Google. Simply sync your Google Calendar with HoneyBook, then head to your Google Calendar directly to share it with that team member. Once it’s been shared through Google and that team member has synced their Google Calendar with HoneyBook, they’ll be able to view all of your calendar's pertinent information.